Prescott City Hall is located at 800 Borner Street, Prescott, WI 54021; phone: 715-262-5544. Photo: Daniel Smith House, ca. 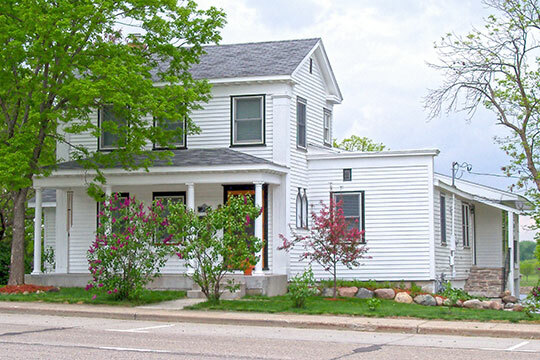 1853, 331 North Lake Street, Prescott, WI. Listed on the National Register of Historic Places in 1984. Photographed by User:AlexiusHoratius (own work), 1010, [cc-by-3.0 (creativecommons.org/licenses/by/3.0)], via Wikimedia Commons, accessed August, 2015. Prescott was settled in 1840 and received its official name in 1851. The City was named after Philander Prescott who built a home and a store on the present day site of the City of Prescott. Philander Prescott was born September 17, 1801 in Phelpstown, New York and arrived at Camp New Hope (Fort Snelling) in Minnesota in 1820. He married the daughter of a Dakota chief in 1823. Prescott and his wife and their children lived among the Dakota for more than 40 years. What would become the City of Prescott began as a military land claim in 1827. It remained unpopulated until the arrival of Philander who at that time was an Indian interpreter and agricultural supervisor at Fort Snelling in Minnesota. He resided in Prescott and at the Fort alternately until his death in 1862. Philander was sent by the government on a peace mission to meet with the Sioux Indians near Mankato where he was killed at the beginning of the Dakota Conflict. The Mississippi and St. Croix Rivers played a major role in the shaping of Prescott. River traffic passed by as people and goods traveled north and the area became a center for shipping, milling, and transportation. Over time, the lumber industry became more important. Logs were floated down the St. Croix River. Warehouses were built to store food and supplies. A continued influx of immigrants meant hotels, restaurants, banks, and new homes were constructed to meet the demands of the new population. As rail travel overtook steamboat traffic and logging subsided, settlers came in decreasing numbers. City of Prescott, Wisconsin, Comprehensive Plan Draft, 2015, www.prescottwi.org, accessed August, 2015.